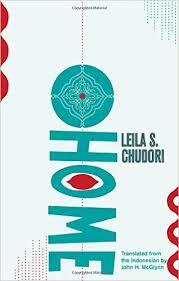 Leila S. Chudori’s Home (translated by John McGlynn, review copy courtesy of Deep Vellum Press) takes a look at the history of Indonesia between 1965 and 1998 through the eyes of a family caught up in the tumultuous events of the period. Dimas Suryo is a journalist with slight leftist leanings, so it’s lucky that he is out of the country in 1965 when a Communist coup fails, thereby avoiding the inevitable and bloody backlash. Safety comes with some serious strings attached, though – while he is free from the fear of arrest and torture, he can never go home. Where Eka Kurniawan’s Beauty is a Wound looked at some of the events mentioned above in a localised (and allegorical) way, Home provides the clueless foreigner with an explanation of what life in Indonesia at the time was really like. The novel is bookended by two historical events: the first is Suharto’s use of a failed coup to annihilate his enemies, leading to a mass murder of genocidal proportions; the second is his eventual downfall three decades later. In introducing a family caught up in these events, Chudori is able to introduce the reader (many of whom, even in Indonesia, have little idea of the ‘real’ version of events) to what actually happened. He knows (and Lintang will see thirty years later) that riots in a civilised country can’t be compared to what has gone on in Indonesia. Gradually, through flashbacks and Lintang’s experiences, we learn of the chaos in Jakarta, and the bloody rivers full of bodies elsewhere in the country. Despite the dangers Indonesia holds, and the attractions of the French capital, Dimas maintains his desire to return home. Never having truly arrived in Paris, he dreams of one day going back, even if only to be buried in his mother country, and the turmeric and cloves in the jars he keeps, the restaurant, the kretek cigarettes he smokes (whose scent makes them his own personal Madeleines…) all serve to remind him that he’s a man in a foreign land. Years later, when Lintang arrives in her father’s home country, she experiences the same feeling, a nostalgia for a place she’s never known, and begins to wonder just how Indonesian she actually is. Luckily, on arriving in Jakarta, Lintang receives the support of her extended family, benefiting from the close-knit Indonesian family culture. It’s this, perhaps, that Dimas misses most of all during his lengthy exile in France, unable to see his brother and the rest of his family. However, this benefit can quickly turn to a drawback if your blood ties are not what the ruling regime would consider suitable. Lintang is soon to discover that many people back in Jakarta are forced to conceal their identity lest their past come back to haunt their present life (and job prospects…). This scene takes place a few years after the events of 1965, but we later see that it still holds true in the nineties,. Many educated people are unable to get decent jobs because of links to those accused of being communists decades earlier. If this is true in Paris, it’s even more so back in Indonesia. Through a white-washing of history, aided by stunning museums and compulsory school lessons, the regime attempts to make everyone believe its side of the story. Slowly, though, the cracks appear, and history shows that when they do, things can change very quickly. This sounds fascinating Tony. I like stories about political regeims and the historical background of other countries. I imagine it makes for powerful reading. I will say, the prose seems a bit flat, from your quotes? I find a lot of translated literature is published based on ‘content’ merits, but what I find on the page tends to be a bit dull, no? She’s also a journalist, that, together with the subject of this novel can explain the writing style. Tony you’ve meet my expactations! You manage to review books I’ve not read and thus broadened my views of Indonesian Lit. Thanks! Correction: ‘expectations’ is what I meant. Sorry.